Local scientists and science enthusiasts will battle it out this evening (Thursday ) for a place in the national final of FAMELAB, the largest science communication competition in the world. The regional heat will take place at 7pm tonight at An Taibhdhearc in Galway and the event is free to attend. The participating contestants come from a variety of backgrounds, covering topics ranging from cancer to genetically modified food. Topics presented will include: “The invisible universe”, “Always need a friend”, “Cancer: A journtey from diagnosis to prognosis using Genomics”, “Cheers to Meiosis”, “GFP- lighting the way in biological expression”, “Genetically modified food”, “Herd immunity and the increasing importance of vaccination in an era of science denial”, “the ultimate puzzle”, “Ankylosing Spondylitis: More than just a pain in the neck” and “The Power of Effective Practice”. The competing scientists will be given a total of three minutes each to explain their research, or any scientific concept, as clearly and simply as possible, to a public audience and a panel of judges. This will be followed by three minutes of questions from the judges and the audience. Two finalists will be announced on the night and will participate in a communications master class in Dublin this March. The finalists will then compete in the national final of FAMELAB, which will be held in the Science Gallery in Dublin on Thursday, 12 April. The overall national winner will attend the Cheltenham Science Festival, UK in June 2018 and will compete in the FAMELAB International finals. The regional heat in Galway will be hosted by Professor Brian Hughes, Professor of Psychology and author of Rethinking Psychology: Good Science, Bad Science and Pseudoscience and popular blog thesciencebit.net Entertainment during the interval will be provided by the “Queen of the offbeat”, comedian Áine Gallagher, fresh from her 2017 shows at the Edinburgh Fringe Festival and Vodafone Comedy Carnival. The panel of judges include: Anne Casserly, Manager of Galway Science and Technology Festival; Dr Gavin Collins, Vice Dean for Science Technology Engineering and Maths promotion, NUI Galway; Paula Healy; Manager of Flirt FM 101.3 radio station; and John Loughlin, Vice Chairperson of the Irish Science Teachers’ Association and Science teacher at St. Joseph’s College (The Bish ) in Galway. To attend the FAMELAB Galway regional final please book your free ticket at www.famelabgalway2018.eventbrite.ie or following on Twitter @FameLab_Galway. 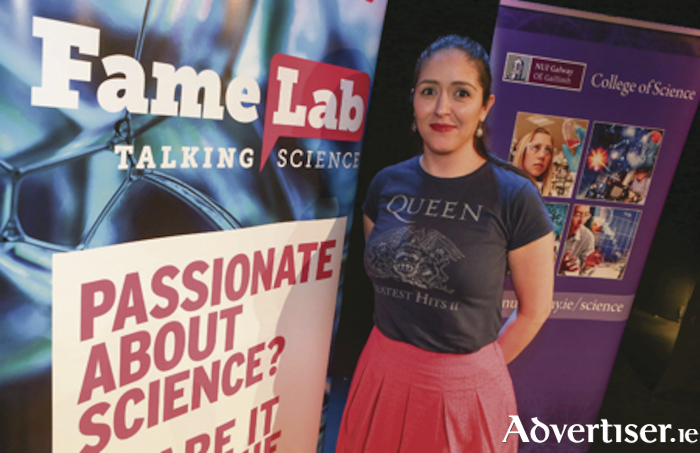 For further information about FAMELAB Galway contact Joanne Duffy, NUI Galway at [email protected].